It’s been a fully packed year in the OpenNebula project and in the cloud computing field. The community is as healthy as ever and is driving your favourite Cloud Management Platform (CMP) to its consolidation as a real, enterprise-ready and open source alternative to transform datacenters into private clouds. OpenNebula is really vendor-neutral, there is no hype, just a focus on real-life needs, developing the best technology, and serving our users. We think it is important to clearly state what “open”, “simple”, “scalable”, and “flexible” mean for us. Mostly because, as you well know, terms like “open-” and “open-source” are used by many vendors as a marketing tool to lock you into their own version or distribution of a hyped open-source software. We are also proud of being counted among the Cloud Computing pioneers. These two papers present the original internal design and architecture of the Eucalyptus and OpenNebula cloud management platforms, the very first two open source CMPs. With 2014 coming quickly to a close, we’d like to review what this year has meant for the OpenNebula project. You have all the details about the great progress that we have seen for the OpenNebula project in our monthly newsletters. Three major releases were published during this past 2014: 4.6 Carina, 4.8 Lemon Slice and 4.10 Fox Fur. Moreover, three maintenance versions were released to fix bugs and polish features. Several maintenance versions of AppMarket were also released. One of the most relevant features introduced by 4.6 Carina was the ability to create Federations of several OpenNebula instances, and their subsequent partition into Virtual Datacenters, by bounding a group of users to a set of hardware resources: the OpenNebula provisioning model is now considered mature. Also, Carina brought a new Cloud View Portal and support for OVA imports directly to an OpenNebula cloud. The focus of 4.8 Lemon Slice was simplicity, with several improvements to the Cloud View portal (an important key in the provisioning model) like the addition of the VDC Admin View, based as well on the simplicity designs of the self service portal. The hybrid model was also extended with support for IBM SoftLayer and Microsoft Azure public clouds, and changes in the OneFlow and OneGate made possible sharing service information among VMs. Virtual Networks underwent a thorough redesign: definitions are no longer restricted to the fixed and ranged model, but rather they can include any combination of ranges to accommodate any address distribution. 4.10 Fox Fur was the latest major release of 2014, and it was a very special one, since it featured a little revolution in shape of vCenter support. It is the first OpenNebula release that allows to automatically import an existing infrastructure, since the new vCenter drivers allow to import Clusters and Virtual Machines from a vCenter installation, significantly smoothing the set up curve. Also, Fox Fur introduced an integrated tab in Sunstone to access OpenNebula Systems support and login token functionality. We would like to thank to all code contributors and sponsors, and especially to Produban, BlackBerry and Echelon for funding several features this last year through the Fund a Feature program. We look forward to your contributions to code development!. 4.10 Fox Fur brought VMware vCenter support to OpenNebula, and it was the seed for a new product by the OpenNebula Team: vOneCloud, a virtual appliance for vSphere that transforms an existing vCenter deployment into an automated, self-service private cloud in a few minutes. The appliance is based on OpenNebula, every component is fully open-source and has been certified to work in enterprise environments. vOneCloud exposes a multi-tenant, cloud-like provisioning layer, including features like virtual data centers, self-service portal, or hybrid cloud computing to connect in-house vCenter infrastructures with public clouds. vOneCloud seamlessly integrates with running vCenter virtualized infrastructures, leveraging advanced features such as vMotion, HA or DRS scheduling provided by the VMware vSphere product family. 2014 saw the first stable release of vOneCloud, which we believe is going to transform the way numerous VMware-based data centers perform their IT processes. Interesting right? Try it out, it takes very little time and it is not intrusive. We look forward to your feedback!. We’ve been rapidly growing our vibrant community of users who are supportive, engaged, and opinionated about the direction of OpenNebula ever since. Many of them have contributed new integrations with other platform components in the data center like IBM Storwize V7000 SAN, salt-cloud, Infiniband (SR-IOV devices), Bacula, Chef Kitchen, .NET API, Nodejs, Cloud-init, Ansible or The Foreman – just to name a few. We are proud to confirm that the number of downloads from our repositories continue doubling each year. There are tens of thousands of deployments around the globe and OpenNebula is parked in some of the biggest organizations out there including Industry and Research leaders. This year we performed a new Cloud Architecture Survey to know about the types of OpenNebula cloud deployments and their main architectural components. We would like to thank all our users! It is out of scope to name all new users, but we want to give a wholeheartedly warm welcome to those new users that shared their experiences through our blog: Runtastic, Avalon, China Mobile, Rentalia and BIT.nl. If you are using OpenNebula, we want to hear from you! We look forward to having more details about your deployment and experiences!. You are very welcome to contribute your integrations and experiences by writing a post in our blog or submitting your integration to the OpenNebula Add-on Catalog. 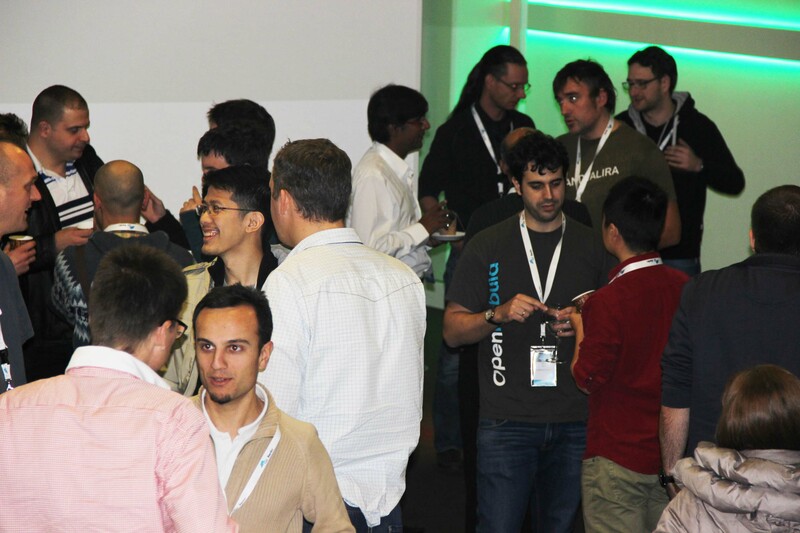 Our biggest event in 2014 was undoubtedly the OpenNebula Conf! Held in Berlin, and organized by Netways, at early December. It featured lots of very interesting users: RedHat, Runtastic, Deloitte… Check out the videos and, more importantly, the amazing feedback gathered by the team from the OpenNebula users. This is what makes OpenNebula unique, it’s down-to-earth, user-driven model. This year the team was very busy spreading the OpenNebula word in several events. Important events with OpenNebula representation were CeBIT 2014, FLOSS UK 2014, several CentOS Dojos (like for instance this one in Brussels, jointly with Fosdem 2014), CloudScape VI, Cloud Expo Europe, Future Internet Assembly, Closer 2014, EGI Community Forum, GigaOM Structure, HostingCon, LOADays and many, many more! We want everyone at least to have the chance to know about what we think is the easiest to use, most powerful and definitely most enterprise ready open source CMP!. A series of events crafted by OpenNebula are the OpenNebula TechDays. Probably the most relevant ones this year happened in both US coasts: Florida and San Francisco hosted by TransUnion|TLOxp and Hyve Solutions. Other relevant TechDays took place in Europe: Timisoara by CloudBase and Unified Post, Santiago by Agasol, Ede by BIT.nl, Barcelona by CSUC, Almendralejo by CENATIC… and much more to come in this 2015!. We want to thank all organizations that hosted a TechDay in 2014 for their amazing hospitality and making these events a success. We are organizing the schedule of TechDays for future months, send us an email or send it to the community discuss mailing list if you are interested in hosting a TechDay event. We also look forward to proposals to create a user group in your area. We think it is impossible to stress too much or too often the importance of our community. THANK you all (users, developers, integrators, cloud architects, all of you!) for helping us building a great cloud management platform that solves real world problems. We’d also like to take this opportunity to wish you happiness and prosperity in 2015 to you and your loved ones!. We want to keep you up-to-date with the main news and the latest information about OpenNebula and what you can expect in the following months. The OpenNebula team is preparing a new maintenance release for Fox Fur. 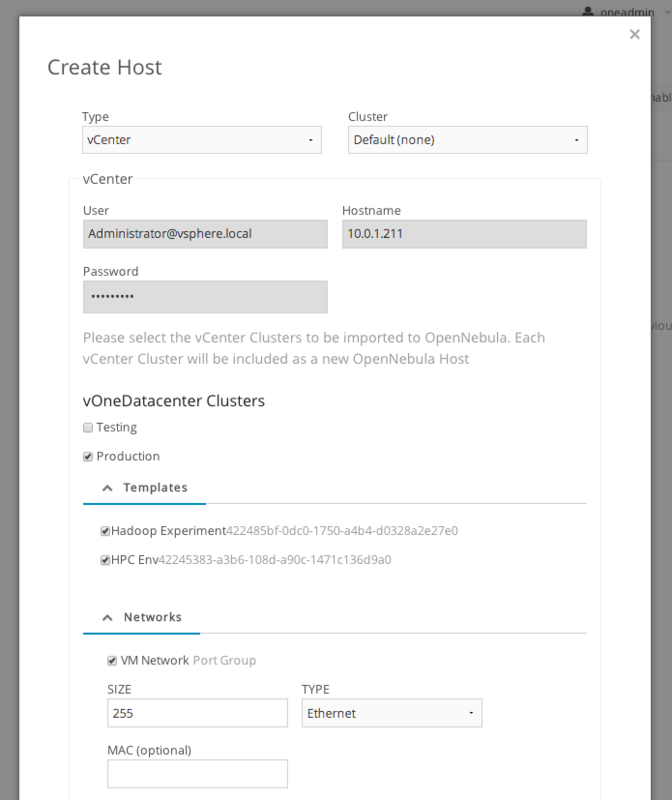 OpenNebula 4.10.2 will come with several bugfixes, the complete list can be consulted here. There are several affected components, ranging from drivers to the OpenNebula core as well as new Sunstone views. Also a new feature related to the newly introduced vCenter support will be present in this new version, the ability to manage and import vCenter Networks as OpenNebula Virtual Networks, supporting IPv4, IPv6 and Ethernet address ranges. This also means that attach and detach network interface cards is possible for vCenter VMs. We would like to thank Echelon for making this feature possible through the Fund a Feature program. The team (which never rests ;) ) is also working in awesome new features for the next stable release, 4.12, like this nifty SPICE support for accessing your VMs. This month was specially important for the OpenNebula project due to the release of the first stable release of vOneCloud 1.0, a CentOS Linux virtual appliance for vSphere that contains all required OpenNebula services optimized to work on existing VMware vCenter deployments, allowing to deploy an enterprise-ready OpenNebula cloud in just a few minutes. vOneCloud is for companies that want to create a self-service cloud environment on top of their VMware infrastructure, turning infrastructures managed by already familiar VMware tools such as vSphere and vCenter Operations Manager into automated, self-service private clouds where the provisioning, elasticity and multi-tenancy cloud features are offered by OpenNebula. Our community is a healthy, vibrant and supporting, as we re discovered in this year OpenNebula Conference (read below for more details). To name but a few, OpenNebula has recently received a new shinny addon to support the IBM Storwize V7000 SAN. This is really valuable to the OpenNebula project since it is very difficult to support any piece of hardware from the datacenter, but with the help of our community we are getting at least the important bit. Thanks for your effort! Words of encouragement are also very welcome in the workaholics team of OpenNebula. Specially words like these which perfectly capture the philosophy that drives the OpenNebula project. We held the second edition of the OpenNebula Conference this past month in Berlin, Germany. A very important result of the Conference was the amazing feedback received from the important actors in this field, ie, the OpenNebula users. We wanted to summarize the requested features and comments since for us this feedback is the main driver for the following roadmaps. This is what being a user driven project mean. We have events in schedule already for early next week, like this RedIris multi-video session with presentations around the use of OpenNebula (Disclaimer: In Spanish). We are prepping as well for the next Cloud Expo in London, next March 2015, where we will be present in one of the corners of the Open Cloud Park (of course!) with our partners CloudWeavers and ViApps, and we would also like to invite you to join us in the upcoming FOSDEM’15. Moreover, the OpenNebula project will be represented in the next VMworld Europe to be held in Barcelona next 13th-15th of October 2015. We have upcoming TechDays in future months, if you are interested in OpenNebula you can check the project page. Send us an email or send it to the community discuss mailing list if you are interested in hosting a TechDay event. OpenNebula Systems announced today the first stable release of vOneCloud, a virtual appliance for vSphere that transforms an existing VMware vCenter deployment into an automated, self-service private cloud in a few minutes. The appliance is based on OpenNebula, every component is fully open-source and has been certified to work in enterprise environments. vOneCloud is commercially supported by OpenNebula Systems. Last week we celebrated the OpenNebulaConf 2014, an event where the community comes together to share their experiences and new ideas around OpenNebula. If you were there, go ahead and take a look at the photos in the conference page to check if we caught a flattering pic of you. The OpenNebulaConf 2014 was a great event, and certainly our speakers deserve most of the credit for it. Thank you for sharing your expertise! If you missed the conference, now you have a chance to listen to the talks in our YouTube channel, and download the slides from the slideshare account. Enjoy. One of the best things about getting together for the conference is that our community always comes with plenty of new ideas and useful feedback to shape the project’s roadmap. This year’s OpenNebulaConf was full of interesting talks with lots of thoughtful feedback, but we also had many productive discussions in the hacking session, the coffee breaks, and the evening get-togethers. In this post we will try to summarize the main requests we gathered during the OpenNebulaConf. Feel free to join the discussion in the development portal or in the mailing lists. And remember, you are always welcome to add new tickets, don’t be shy! We appreciate it when you open new requests, it’s always better to develop with real needs and use cases in mind. Finally, I would like to take this opportunity to thank all of you for showing up in Berlin and making the conference awesome. See you next year! 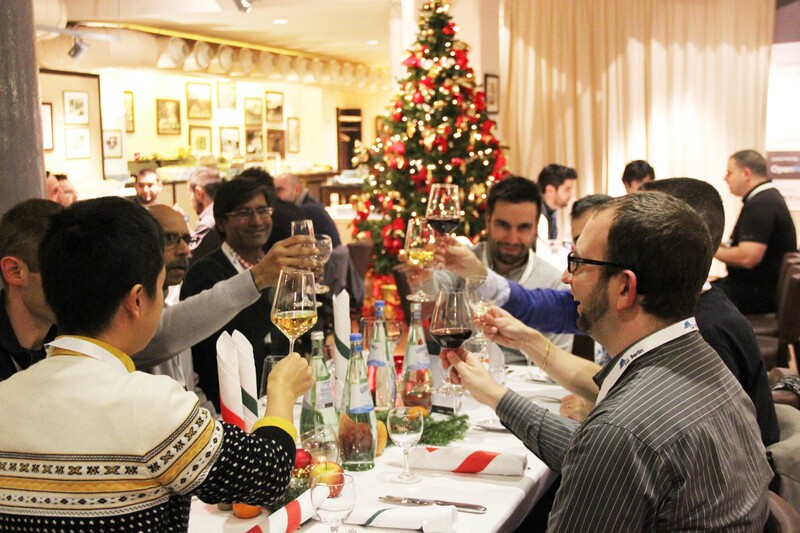 Last few days have been very hectic for the OpenNebula Team due to the second edition of the OpenNebula Conference 2014. Shortly we will post a summary of our experiences in the conference, as well as the videos, presentations and photos. As part of our commitment to deliver the best possible cloud experience, the OpenNebula team released this month the stable version Fox Fur 4.10. A couple of weeks later a number of bugfixes were developed and some minor features as well, so a new maintenance version was also released, 4.10.1. These bug fixes covers different OpenNebula components, like for instance the command line interface, the Cloud View self service portal, OpenNebula Core and several drivers (Auth, Storage), OneFlow and more. The full list of bug fixes are displayed in the development portal.. OpenNebula 4.10.1 also comes with several new features related to the new vCenter integration that made its debut in 4.10, like encrypting password of VCenter hosts in templates, search for templates recursively in vCenter Folders and context for vCenter VMs. This past November was particularly busy for the OpenNebula team, with the release of vOneCloud 1.0 RC, a CentOS Linux virtual appliance for vSphere that contains all required OpenNebula services optimized to work on existing VMware vCenter deployments. vOneCloud is for companies that want to create a self-service cloud environment on top of their VMware infrastructure without having to abandon their investment in VMware and retool the entire stack, allowing to deploy an enterprise-ready OpenNebula cloud just in a few minutes. vOneCloud is capable of turning infrastructures managed by already familiar VMware tools, such as vSphere and vCenter Operations Manager, into full feature clouds where the provisioning, elasticity and multi-tenancy cloud features are offered by OpenNebula. A new maintenance version of AppMarket was also released (we’ve told you we’ve been busy), solves issues reported by the community and has been verified to work with OpenNebula 4.10. Moreover, this last month OpenNebula turned 7 years old! And we thought it was time to revisit and explain again what “open”, “simple”, “scalable”, and “flexible” mean for us. But the OpenNebula team never (well, almost never ;) ) rests, in a few days we will deliver a maintenance 4.10.2 release. And of course we are already working on a 4.12 release for the end of January. Our community is constantly surprising us, while at the same time creating great contents, sometimes even lowering the difficulty to understand and deploy OpenNebula, like this french tutorial explaining how to install OpenNebula in easy steps. We will also give a warm welcome to the guys from Control Engineering, very glad you like OpenNebula and we are sure you will make the most out of your hardware with it. And last but not least, we love community contributions that extend and create a rich ecosystem. A very good example comes by then hand of our friends at BlackBerry, with the release of a Test Kitchen Driver for OpenNebula. We held the second edition of the OpenNebula Conference this past week in Berlin, Germany. It was a great success, with amazing talks from folks from PuppetLabs, E-Post, Deloitte and many more;as well as, borrowing words from Karanbir Singh, an excellent hallway track. Shortly we will post a summary of our experiences in the conference, as well as the videos, presentations and photos. OpenNebula team members were on the road this last month to spread the OpenNebula word. 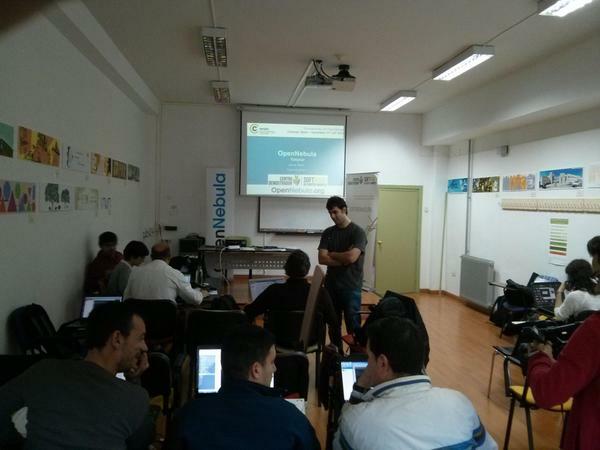 For instance, in association with the University of Extremadura an OpenNebula tutorial were given last 11 and 12 of November. We have upcoming TechDays in future months, if you are interested in OpenNebula you can check the project page. Send us an email to events@opennebula.org or the community discuss mailing list if you are interested in hosting a TechDay event. We would also like to invite you to join us in the upcoming FOSDEM’15, check out the details. …or the day before the Conf – depending on how you count. We started the day early to get from the NETWAYS headquarter in Nuremberg to the conference hotel Berlin. Our friends from OpenNebula were already there and we could make all preparations for the workshops very smoothly. There was even enough time to take a snack. The day after the actual conference will and will be officially opened with Ignacio M. Llorente kick off “State and Future of OpenNebula”. We also looked forward to David Lutterkort talking about what an enchanting match Puppet and OpenNebula are. Another great keynote will be delivered by Carlo Daffara, showing us why disaster recovery is really important and how can you take care of it using OpenNebula. The early afternoon will then be filled with lightening talks curated Daniel Molina until it was time for lunch. These talks included presentations about Docker and OpenNebula, a very interesting topic approached differently by OpenNebula users. Late afternoon (or pre evening event time slot, as we call it) will start with another highlight: Armin Deliomini will tell us how Runtastic switched from commercial products to Open Source only. Now, about one year later, he will give us an insight to the Status Quo where the private infrastructure for more than 40 000 000 registered users for Runtastic is implemented. Also the talks of Jose Angel Diaz (CENATIC), Jordi Guijarro (CSUC) Tino Vazquez (OpenNebula) and many more will sweeten the time until the evening event finally starts. This year we will be at the restaurant “Alte Meierei”.